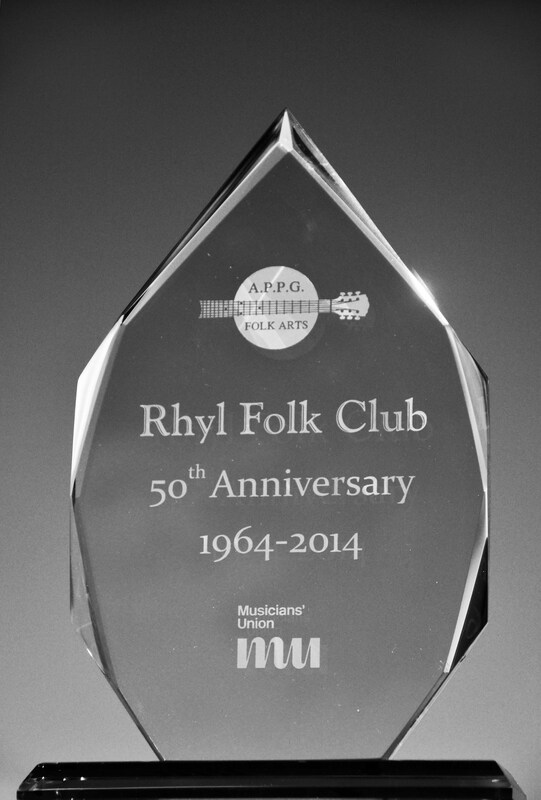 Rhyl Folk club was awarded the All Party Parliamentary Folk Arts Group Award, March 2014. Friday April 19th _*** CLUB CLOSED*** (Good Friday). Friday April 26th – AGM 7.30, then Singers Night / 55th Anniversary Party. Friday May 3rd – Guests Tom McConville & Michael Higgins.£5 on the door. Friday May 10th – Singers Night. Friday May 17th – Singers Night (Urdd Eisteddfod fund raiser). (For details of future guests see “Club News & Forthcoming Events). Doors open 7.45, starts 8.00, finish 10.45. Admission for singers nights – £2, singers £1; free entry into raffle ( possibly the best raffle in the world). Congratulation on running the club successfully for such a long time, also on the website which is easy to navigate and full of information. April 26th 2013. Walked in of the Coast Road and discovered the old spirit of ‘The Bee FolK Club’ from my youth. I even found Dave ‘Cos’Costello sitting listening. (Dave was on stage when I was a lad.) We listened together this time. It was excellent and what a lovely group of people. Thank you so much to everyone at the club for such a warm welcome and for such kind comments. I had a fabulous night with you, enjoyed some serious quality live music and friendly companionship. Nothing could have made me happier. ;’) Thanks to you all. Apologies for not knowing any Chas and Dave numbers – will do better next time! Been told you played host to Phoebe Rees, from Oswestry. Missed it, darn it! When are you bringing her back? A staggering talent! You will have to keep track on the website!